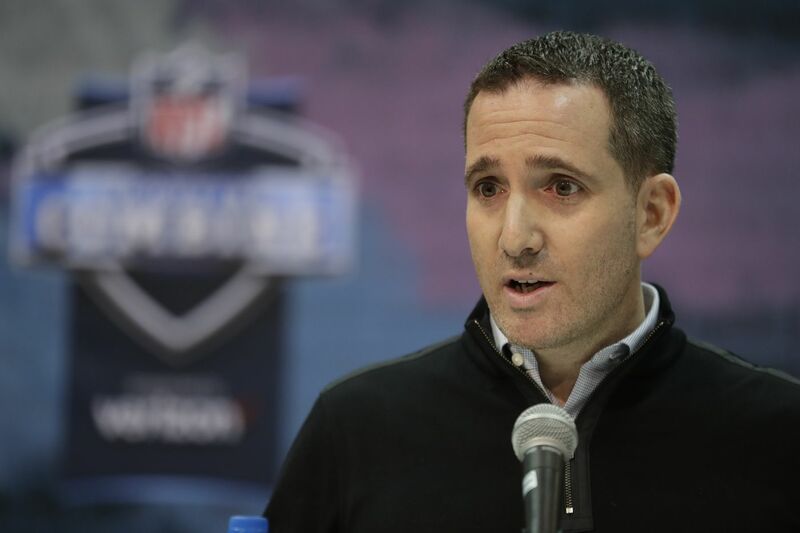 Eagles executive vice president of football operations Howie Roseman has been busy extending and restructuring contracts. Good morning. We’ve now entered the busy portion of the offseason, as you saw during the past week when the Eagles were at the combine and active with contract extensions. That’s only the appetizer for what’s to come during the next two months, with free agency opening in one week and the draft seven weeks away. This is a Wednesday edition of the Early Birds newsletter, which comes once a week during the offseason. I want to know what you think, what we should add, and what you want to read, so send me feedback by email or on Twitter @ZBerm. Thank you for reading. Eagles coach Doug Pederson embracing defensive end Brandon Graham (55) after a game in December. The combine is the unofficial start to the offseason and had its share of rumors and Eagles nuggets to dissect — Jeff McLane did a good job wrapping it up in the Sunday Inquirer — but there were draft prospects to evaluate, too. This has been heralded as a historically deep defensive-line class, and that’s even more apparent after the weekend with the athletic testing. Whether it’s edge rushers or interior linemen, this is a loaded class. Some of the edge rushers solidified themselves as top prospects with their testing numbers, including Mississippi State’s Montez Sweat and Florida State’s Brian Burns. At No. 25, I think the Eagles can find value with a defensive tackle. Pay attention to Clemson defensive tackles Christian Wilkins and Dexter Lawrence. I think the dream candidate for the Eagles would be Houston’s Ed Oliver in a trade-up scenario if he slips into the teens. His athleticism is rare for that position, and he fits what the Eagles like to do at defensive tackle. One big takeaway from the athletic testing was the top-end speed in this wide-receiver class. This is a good year to be in the market for a speed receiver apparently. Seven receivers ran a sub-4.4 40-yard dash, more than the past three drafts combined. The fastest wide receivers were Ohio State’s Parris Campbell and UMass’ Andy Isabella (both 4.31). Campbell is an intriguing player to watch in the second round if he’s on the board; his versatility and the way he can be used all over the formation would be something that the Eagles haven’t had — and coach Doug Pederson has sought. There weren’t many headlines from the running-back workouts, although Temple’s Ryquell Armstead (a Millville native) helped himself with his athletic testing. Alabama’s Josh Jacobs, the top running back, didn’t work out. Florida Atlantic’s Devin Singletary had a disappointing 40 time, 4.66, which did not help his stock. The biggest story among the prospects was quarterback Kyler Murray, who could go No. 1 to the Arizona Cardinals. There’s certainly growing buzz. Of course, if that happens, where would 2017 first-round pick Josh Rosen go? This is worth watching for Eagles fans because Washington and the Giants could both look for a bargain with Rosen, who was the No. 10 pick one year ago. It’s been a busy start to the month for the Eagles, with contract extensions for Brandon Graham, Jason Kelce, and Isaac Seumalo; not picking up the option on Tim Jernigan; and restructuring the contract of Lane Johnson. * When the season finished, I was skeptical that Graham would return unless it was a team-friendly deal. But the market likely became apparent at the combine, and I thought the agreement reached (three-year deal with $27 million during the first two years) was fair for both sides. The Eagles get the security of a known, respected player who fits in their defense and the locker room. Graham gets a lucrative deal at age 30. I think Graham would have received a big deal if he hit the market next week — look at all the edge rushers slapped with franchise tags this week — but this is certainly a reasonable contract. I’m curious to see how this plays out; regression would be the concern, but sound pass rushers tend to age well. * The Kelce contract rewards an All-Pro center and also sounds as if it will open cap space for the Eagles this year, which is important. The possibility of retirement had been hovering over Kelce, and though he said he wasn’t leaning in that direction and didn’t need the contract to come back, it certainly didn’t hurt. * By extending Seumalo, the Eagles keep a player they like and they believe will be a starting offensive lineman moving forward. I still need to see the contract numbers, but the evaluation will be more important than the valuation on this one. It’s not certain that Seumalo will be a surefire starting offensive lineman. He showed promise last season, but the sample size is still small and he did lose his job in 2017. If he’s a starter for the next four seasons, it’s a credit to the Eagles. But there’s an opportunity cost associated with this signing, too, and the Eagles seem committed to Seumalo. * It’s not surprising that the Eagles are moving on from Jernigan, given his price tag and his injury and lack of production last season. If you can get the 2017 Jernigan back out there, it would be a more difficult decision. But with the Eagles looking to open cap space, this move made sense. The league year officially will begin in one week — 4 p.m. on March 13 — and the legal tampering period will open two days before. My guess is the Eagles will be more active than one might think. They’ve already taken steps to open cap space. This is not to say they’ll go dollar-for-dollar for the top-of-the-class free agents, but it could be like 2016 when the Eagles signed Brandon Brooks and Rodney McLeod, giving big contracts to starting-caliber free agents who were not in the top tier. Before the Eagles reach next week, though, they have some decisions to make. The two most pressing decisions will be with left tackle Jason Peters and wide receiver Nelson Agholor. Both are starters who have big salary-cap hits. My guess is Peters comes back and the Eagles find a way to restructure his contract. I’m not sure Agholor comes back on his current deal; if they can give him a contract extension and spread money over a few years, it would make a lot more sense. Linebacker Jordan Hicks, cornerback Ronald Darby, running back Jay Ajayi, and wide receiver Golden Tate are the Eagles’ top pending free agents. At this point, my guess is each one will hit the market. That doesn’t mean they wouldn’t return, but with one week to go, they should see what the market bears. If Hicks leaves, the Eagles must find a replacement at linebacker. The Eagles will need to give a restricted free-agent tender to quarterback Nate Sudfeld — my guess is a second-round level — and that should happen in the coming days. Another player on whom the Eagles could be forced to make a decision is defensive end Michael Bennett, who won’t have a starting job after the Eagles re-signed Graham. Bennett’s production improved last season after he joined the starting lineup following Derek Barnett’s injury, so it’s reasonable to wonder how he would take going down in the rotation again. The Eagles have needs for starters or upgrades at defensive tackle, running back, wide receiver, third safety, and potentially linebacker. They also will look for someone to compete with Sudfeld for the No. 2 quarterback job. This all won’t come in free agency, because the draft will be critical. Eagles executive Howie Roseman, right, holding the door for center Jason Kelce last July at training camp. Who will replace Nick Foles as the No. 2 quarterback? An examination of where the Eagles stand with Nate Sudfeld and the backup-QB spot. Foles is expected to land in Jacksonville, Les Bowen writes. Mike Sielski writes about Jason Peters and defying time. What were some of Jeff McLane’s takeaways from the combine? Even with Brandon Graham returning, Paul Domowitch says not to rule out the Eagles’ taking a defensive lineman early in the draft. Graham said it was a “no-brainer” to stay in Philadelphia; Jason Kelce discussed his new deal; and Isaac Seumalo signed a contract extension. The Eagles’ top officials don’t have a problem with Carson Wentz’s leadership style, Bowen writes. Is this the year the Eagles invest in a running back? McLane examines. Domo gives you a running back to watch on the undrafted market. Who are your 5 free agents who should be watched closely by Eagles fans? I'm thinking mainly about mid-tier guys, would be great to hear your thoughts with names. Also, which positions will be in focus? +1: do you expect at least one trade? The free-agent wide receiver who would be ideal for the Eagles is the Chargers’ Tyrell Williams, a big deep threat who could start opposite Alshon Jeffery. But my guess is Williams will be one of the top two free-agent receivers, so the Eagles might be priced out. A player in a lower tier to watch is Kansas City’s Chris Conley, who also has the size-speed combination to play on the outside. He hasn’t had the big production to warrant big money, but he’s 26, does what the Eagles like at that spot, and has a background with Doug Pederson. The running back who would fit well in free agency is Atlanta’s Tevin Coleman, but he could earn a big contract, too. Le’Veon Bell would be a dream signing for the Eagles — I could see that happening only if he doesn’t get the top deal he’s seeking, similar to Jeffery in 2017. New Orleans’ Mark Ingram is another good fit with proven production, although I can’t see the Eagles paying big for a 29-year-old running back. The Eagles could also look in the trade market for a player such as Cleveland’s Duke Johnson. At defensive tackle, the Eagles would be well served looking at this draft class. If they want a veteran to start immediately and they are willing to invest big money, they could do a lot worse than Ndamukong Suh, who thrived in this defense under Jim Schwartz in Detroit. New England’s Danny Shelton is a former first-round pick with Cleveland who is only 25 and could replace Haloti Ngata (and Beau Allen before him) as a big early-down defensive tackle next to Fletcher Cox. I’m not sure the Eagles will invest much at linebacker if they let Jordan Hicks walk. I’d rather pay Hicks in that case. They’d more likely find someone who can compete for time with Kamu Grugier-Hill and Nate Gerry. At backup quarterback, I’d watch out for Tyrod Taylor if the Eagles want to go the veteran route. There are other quarterbacks who will be released who could factor into the mix, too. They don’t have a starting competition to offer, though, so the Eagles might not be the top candidate for some of these players. But the Eagles do have a starting quarterback who has missed the last two Decembers.